On the 28th February 2013, the Council adopted a Local Development Plan (LDP) for Pembrokeshire (excluding the area of the Pembrokeshire Coast National Park). 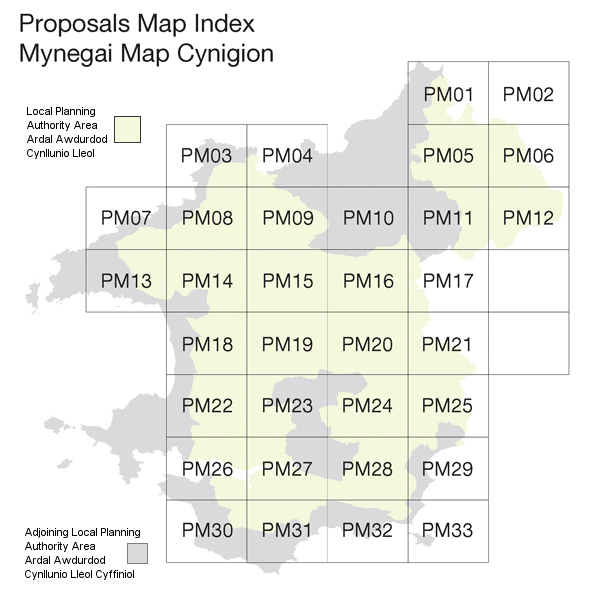 The map of Pembrokeshire below can be used to navigate through the Proposal and Inset Maps. The Ordnance Survey map data included within these maps has been provided by Pembrokeshire County Council under license from the Ordnance Survey in order to fulfil their public function to act as planning authorities. Persons viewing this data should contact Ordnance Survey copyright for advice where they wish to licence Ordnance Survey map data for their own use. Click on a numbered area of the map below to view the proposal map. If you wish to view an Inset Map, firstly click on the appropriate Proposals Map sheet. Then click within the required Inset Map box on the Proposals Map sheet.